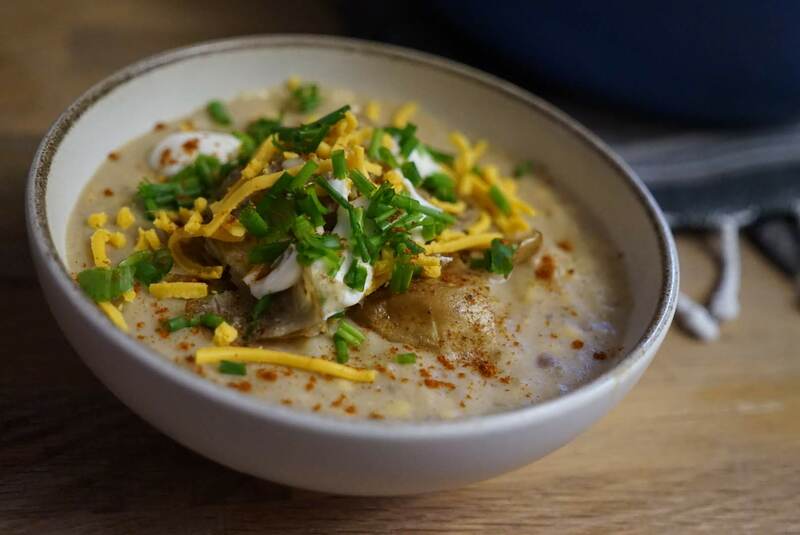 Veganmofo 2018 – Baked Potato Soup – vegan in your city. I love baked potatoes, I love soup, I love baked potato soup. It’s a creamy flavourful and thick soup that just feels like a warm hug on a cool day. Just waiting to be made in the fall as the days get cooler and shorter. But of course, it’s September in Toronto and that means it’s still just under 30 degrees celsius (that’s 80F if you’re using it) so this soup is ahead of its time today, but I’ve been thinking about this soup for weeks and it just couldn’t wait for another day. This recipe is inspired by the work of Guy Fieri and his fully loaded baked potato soup, but obviously veganized. It’s not terribly complicated, but can be, depending on how you’re feeling – I started by washing and roasting the potatoes, because they take the longest to finish – around 45 minutes – and it gave me time to do other soup related tasks. Baking them is absolutely worth it though – the added complexity of flavour is a delight. Vegan Magic is a vegan bacon grease type product made in Toronto, and available worldwide. To find out if it’s available near you, check out their website, but if you want to make your own, The Gentle Chef has you covered too with his recipe for Bacun Grease. One of the things that I like to do with soups that allow for it, is to add mashed beans for extra protein – especially in a soup such as this one, that would otherwise be quite carb-centric. I had dry white beans kicking around, so I rinsed them and tossed them in my instant pot to cook under pressure while the potatoes roasted, but canned beans work just as well too. The nice thing about a potato centred soup is that you really don’t have to follow a recipe, at least not precisely. It is forgiving and open to almost any kind of chaos you have in mind that day – but if you want to follow a recipe, I hope you enjoy this one! A creamy flavourful and thick soup that just feels like a warm hug on a cool day. Place the potatoes on a roasting tray and bake for 45 minutes. When done, the tip of a paring knife should go through the potatoes easily. Take a medium sized pot – this is going to be your pot for everything – and set to low-medium heat with 2 tbsp vegan magic. Add the flour to the Vegan Magic in the pot and stir to combine. Cook until the flour and fat has combined, about 1 minute. Pour in the non-dairy milk slowly while you whisk to incorporate. Cook over medium heat until bubbly and thickened, stirring frequently, about 15 minutes. Scoop out the potato pulp from the skins and add to the non-dairy milk mixture. Mash with a whisk or spoon, but let it remain a little chunky. Save the potato skins if you want to pan fry them and use them as a topping for the soup. Add 1 cup of the non-dairy shreds and the nutritional yeast. Season well with salt, pepper, and paprika. Stir until the non-dairy shreds have melted. 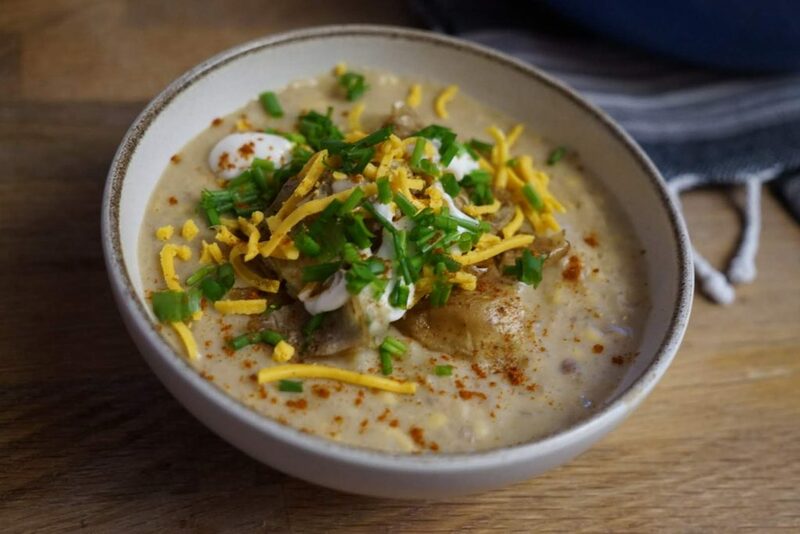 Ladle the soup into bowls, top with potato skins drizzle with non-dairy sour cream, sprinkle with vegan bacon bits, paprika, grated shreds, and chives. This sounds amazing! I see quite a lot of baked potato soup recipes, but I don’t think it’s really a thing in the UK. Clearly it should be though!